Garage door springs are a vital part of your garage door system. Without springs, you wouldn’t be able to stay safe and dry in the comfort of your vehicle. You’d have to get out and manually open your garage door, regardless of the time of day or weather conditions. That doesn’t sound like fun to us! As is the case with most mechanical components, garage door springs are subject to the wear and tear that comes with everyday use. The manufacturers design springs to last for a certain number of cycles. A cycle consists of one open and one close. The majority of springs are rated for 10,000 cycles, though some heavy-duty springs are rated for as many as 60,000 cycles. If you have a torsion spring system, there are also cables involved and they’re subject to wear and tear, too. Many people only notice modern conveniences, such as remote control garage doors, when they’re not working properly. We’re like that with the coffee maker at the office! It’s always there and only takes a push of the button before delivering deliciousness. Let it not work though and we instantly take notice. The same can happen with garage door springs. Elite Door System’s highly trained, experienced technicians can spot the signs that indicate your door springs may be close to the end of their useful life. Door springs are one of the most dangerous components of your garage system, in addition to being one of the most important ones. Garage door springs are under extreme tension and only professionals should do the repairs. The danger of personal injury and property damage if garage door springs aren’t handled properly is real. In fact, many manufacturers won’t even sell the parts for such repairs to anyone other than a qualified professional for this very reason. If your springs are near the end of their useful life, they’re also near the end of safe operating status. The only option is replacing them. Some systems only have one spring while others have two. If one of your springs is bad but the other is still good, it’s necessary to replace them both at the same time. Otherwise, you risk an imbalance in the smoothness of operation. The cables on torsion spring systems should be replaced at the same time as the springs to ensure peak operating conditions. Elite Door Systems has access to all the necessary parts and tools to do the job safely. We can inspect your door system and determine if repairing your springs or replacing is the right direction. We offer flexible appointments and ultra-competitive prices. You’ll get fast, friendly and professional service from our highly trained, experienced technicians. We also offer annual Tune-up inspections for you complete garage door system. This gives us a chance to spot any upcoming problems, such as worn-out springs, cables and other components so we can repair or replace them. This makes for a safer system for you and less long-term, costly problems later. 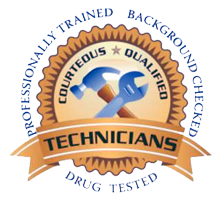 Our techs are highly trained to provide you with professional garage door solutions.